Debenhams has over 150 stores throughout the UK and Ireland with more opening every year. As one of the UK's major department store retailers, we are leaders in fashion for the whole family, homeware to turn your house into a real home, accessories and gifts for every occasion and fine fragrances from the world's leading names. With our unique Designer at Debenhams ranges available in every department, you'll be hard pressed to know where to use your Debenhams Gift Card. An e-Giftcard can be used as full or part payment for merchandise in Debenhams department stores within the UK and online at debenhams.com. This e-Giftcard may not be exchanged for cash or vouchers, used as a deposit on a credit agreement or to purchase financial or travel services. No change or refund will be given when this e-Giftcard is redeemed but any remaining balance may be applied to future purchases. The balance of an e-Giftcard can be checked in store, online at debenhams.com or by calling 0844 800 9091. e-Giftcards expire 24 months after the last use or balance enquiry and any remaining balance will be deducted. Debenhams reserves the right to reject an e-Giftcard that is illegible or incomplete or where, in its sole discretion, it has reason to believe it is not genuine. e-Giftcard numbers/codes and PINs remain the property of Debenhams (including all intellectual property in the source code). Debenhams is not liable for any lost, stolen or damaged e-Giftcards. Debenhams reserves the right to amend these terms and conditions from time to time where it reasonably considers it necessary to do so (e.g. to change the scope of the e-Giftcard service, notify of the service's withdrawal or in the event of circumstances beyond its control). Reasonable notice of such changes will be given where possible. 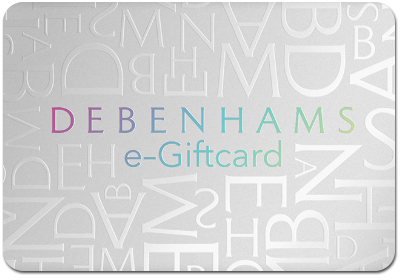 By using this e-Giftcard you accept and agree to the full e-Giftcard terms and conditions available at debenhams.com.